The concept and use of scale in drawing and the importance of choosing the right scale. To represent an object that is large, on a sheet of paper (or a computer monitor) we have to show it at a different size than it is in real life. A scale is a simple ratio. We denote the ratio by using the " : " colon symbol. So in a drawing using the metric system any object drawn on a drawing at a scale of 1:100 will be 100 times larger in real life than the drawing. Likewise an object drawn to a scale of 1:1 will be drawn life size. You guys using the imperial system (you have my sympathy) use common fractions as used in that system for scales, i.e. 1/2, 1/8, 1/16. So something drawn at 1/8 scale will be 8 times larger in real life. Also you will be using scales like 1" = 1' or 1" =10' etc. We have to draw all of our official construction drawings in standard scales. 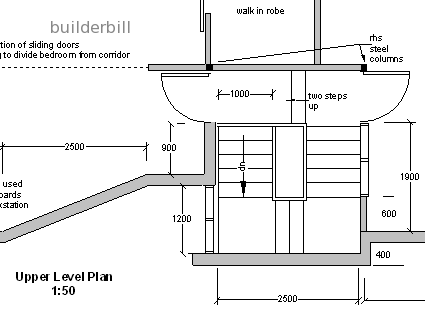 There are standards defined for architectural drawings that must be complied with in respect of the scales we use. For instance I can't use a scale of 1:77 just because it fills my paper nicely. Shown here on this page are some metric system scales. The largest in the sketches on this page is 1:500 which is used for block plans. 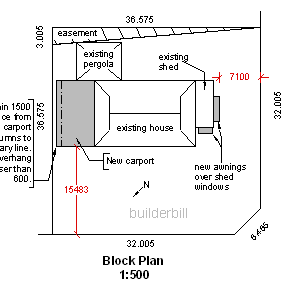 1:100 is a fairly common scale for drawing plans and elevations for house drawings. Scales for details are often in the 1:10 to 1:5 range. For odd sketches we must specifically state NTS or not to scale. The reason for going to all the trouble of defining the scales is that in the old days when pencil and paper were the drawing tools, the draftsman used a scale rule to get the actual lengths to be drawn. If he was using a 1:10 scale he would put that on the drawing so that the user could then get the sizes by using his own 1:10 scale ruler. That's not the case any more, but the CAD programs use exactly the same system of drawing to scale. So objects on the drawing that are not actually dimensioned can still be measured by using a scale rule. This is only correct for true for true copies or the original prints and even then only for obtaining non critical measurements. Rough estimates and the like. Good drawings should have every important size correctly dimensioned or printed somewhere in the drawings or specifications. Many draftsmen actually have "DO NOT SCALE" printed on their drawings. Partly the reason for this is to simply to cover themselves if they make a mistake with their work. But the main reason is that in these days of quick copy shops and cheap reduction or enlarging of copies then many times the drawing given to a roofer on the job may not be at the same scale that is shown. so, DO NOT measure your lengths or angles off the architectural drawings. When we get down to the work of finding the actual angles and lengths of the various roof members you will see that I prefer the old way of solving roofing problems by using geometry methods. By that I mean drawing out the various right angled triangles to scale and then physically measuring the results with no maths calculations involved. Once these geometric principals have been learned then it is easy to move on to faster and more accurate methods like using a pocket scientific calculator and getting the answers by trigonometry. I was taught these methods at night school as an apprentice carpenter and joiner, using a wooden drawing board, a tee square, a couple of set squares, a protractor, a set of compasses, a few pencils and a scale rule. 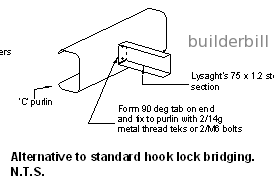 The modern version of the old drawing board is a CAD drafting system. If you are a young guy starting out with an intention of making a career in the building industry, then go ahead and get a CAD program and invest some time in learning how to use it. You will be amply rewarded for your time. But even so you must learn some geometry and a little trigonometry also! If you intend working on the site then you have to do it another way and I will show you how I have worked out hundreds of roofs over a forty years span. 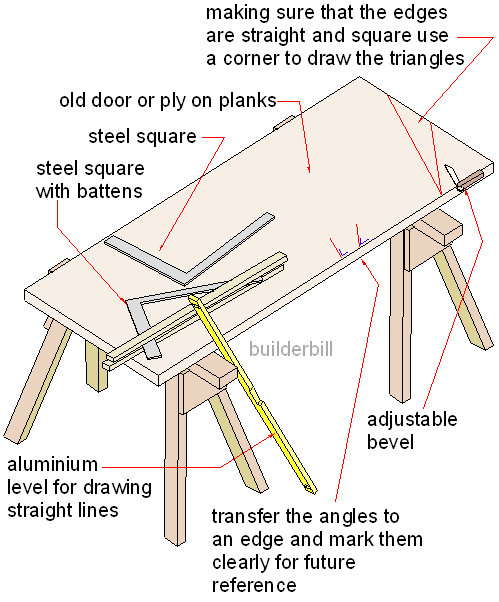 I break everything down to right angle triangles and draw them out to a fairly large scale on a piece of ply or board. On a typical job site I would set up a couple of saw horses or short trestles and throw an old door, or a sheet of ply on it to serve as a bench of sorts. It would be used as a place to keep the drawings safe and to provide a flat convenient place for reading them. It would also get used for tools, boxes of screws etc. Somewhere to keep stuff organised where it can be found easily. Every now and then it may get the gear pushed to one side and it gets used to do a quick scale drawing of a roof triangle, a full size sketch of a tricky joint. All that is really needed is an clean area say 900x600 or 3ft x 2ft. If nothing else was available I have done them on walls or concrete floors. (Using a chalk line on a concrete floor is a great way to set out many things). The bench is the best though for the reason that when a rafter triangle is drawn with the edge of the door or ply sheet as one of the triangle sides then the rafter cuts marked there can be used directly to set the bevels used to mark out the rafters. They are there though the course of the job to be used again to check the bevel if it has been dropped or to reset it if it has been changed. Doing it this way there is no need for making the drawing easy to understand by anyone else. It is for your own information. What you must do is clearly label what each cut is as it is easy to get some of them mixed up. Another useful tip is to always when you have set your bevel to an angle mark it on an edge and write neat it what the bevel is for. Even if you are not drawing them out, but say that you are using a calculator and some sort of protractor then when you are sure that the angle is correct then mark it on a board for reference. This way you have can repeatedly check your bevel just in case it has been dropped and it has moved without you knowing it. so what is the actual scale used on the "door" ? 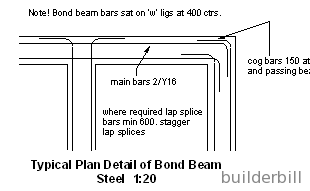 It depends on the actual span or in ridged roofs the half span. Here's an example. A roof with say a 10m half span and a 5m rise (say 32ft and 16ft) which is fairly large for a house roof can be drawn at 1:10 which would give a triangle 1000 run and 500 rise. In the US you may choose to use 1" = 1ft which would give you a triangle of 32" run and 16" rise. This 1:10 scale will give plenty accuracy for the beveled cuts and working with timber if drawn correctly then scaling the rafter length should also be OK.
That means I would be cutting my rafters 3mm, or 1/8" short on in real life. For the most part roof triangles are much smaller than that and 1:5 or 2" to a ft. can be used. This will usually double the accuracy and another improvement is to use a 600m or 2ft. steel rule when drawing and measuring your triangles.